Gatlinburg, TN–Ripley’s® Aquarium of the Smokies is literally teaming with life – our 10,000 exotic sea creatures comprise more than 350 individual species. There are more fish in this aquarium than there are people living in the entire town of Gatlinburg. Although Ripley’s Aquarium of the Smokies is hundreds of miles from the ocean, the scenic beauty and the abundance of water all around make the town of Gatlinburg a “natural” location for a world-class aquarium, America’s most fun aquarium. Their Shark Lagoon is one of the most impressive Aquarium experiences I’ve had because the tunnel is see-thru clear glass that enables you to see every part of the species, while you travel through by glidepath. 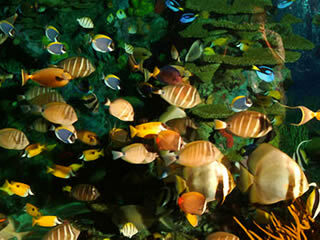 Filled with thousands of fish of every shape and size, this is our largest and most popular exhibit. Leisurely travel on a moving 340-foot long glidepath, as you wind your way through the acrylic tunnel and come face to face with snappers, tarpons, grunts, squirrelfish, a green sea turtle, giant stingrays, sawfish and…very large SHARKS! You and your family will marvel at the clarity of the water and the totally immersive environment. You will feel as if you were exploring the deep oceans and could almost touch the amazing sea life! In this shallow lagoon patrons can reach out and touch rays as they glide by. Their skin is smooth and touching them will not hurt you or the rays. Rays do, however, have strong teeth in their mouths so touching them should be limited to their dark top-sides. Aquarists are on hand to assure the safety of both our guests and rays and to answer any questions regarding these unusual creatures. The Tropical Rainforest display recreates the primeval, lush world of the Rainforest where more than 2,000 species of fish thrive. Discover freshwater stingrays, cardinal tetras, four-eyed fish, poison dart frogs, zebra cichlids, armored catfish, piranhas, mudskippers and more. The Amazon River, which moves over 4 million cubic feet of water per second, is filled with Piranhas, stingrays, armored catfish and lots of other exotic freshwater species. See them here for yourself! Their Pengun exhibit is also very intriguing & I think the kids love it! Enjoy this playful colony of African Blackfooted Penguins in their new state-of-the-art indoor/outdoor habitat. View penguins from above and below the water in this unique and interactive exhibit. Experience penguins swimming as you crawl through clear underwater tunnels. Pop up on the penguins’ private beach and get nose-to-beak.